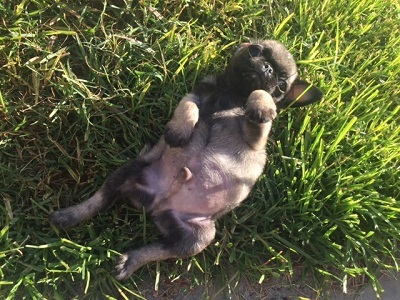 Wally is a Pug puppy who came to us at nine weeks old. Wally’s family originally brought him in for fleas, tapeworms, and decreased appetite. Over the course of the week Wally developed regurgitation, difficulty breathing, decreased appetite and lethargy. As time progressed he continued to decline. In spite of bloodwork, x-rays, ultrasound, and a respiratory panel, Wally’s sickness remained a mystery. Wally’s owners were starting to consider quality of life versus euthanasia options for Wally. Fortunately for Wally and his owners, the excellent care provided by the doctors, nurses, and staff at Advanced Veterinary Care started to turn the tide for Wally. A nasal gastric tube was placed and used to remove fluids and mucus from the stomach. 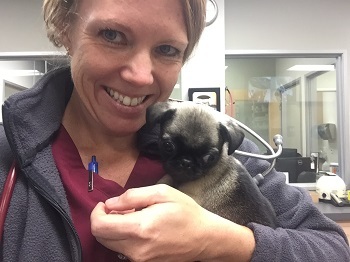 Wally was hospitalized for 2 days and was even taken home by Dr. Riehl for overnight care. Dr. Riehl’s son included Wally’s recovery in his bedtime prayers. Overnight and the next day at AVC, Wally’s vitals were taken every one to two hours and not an hour went by without an AVC staff member coming by Wally to offer him a pat and a few words of encouragement. Wally was tube fed and received intravenous hydration while hospitalized. When Wally showed signs of improvement, he was spoon fed baby food. After two days of around the clock care, Wally’s condition began to improve and he was allowed to go home. Wally is now a feisty little puppy who loves to play and go for walks. Wally was seen at AVC one week after his discharge to start his puppy vaccines. He is now a happy and healthy puppy. 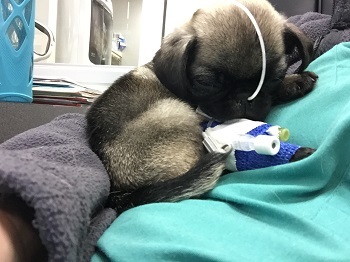 While most animals do not require the amount of care that Wally did, we want owners to know that the doctors and staff at AVC are committed to providing the best and most comprehensive care available to all our patients. We at AVC look forward to caring for Wally and your pet well into the future.